These butterscotch blondies have a rich butterscotch taste and are filled with butterscotch chips. They’re dense, chewy, fudgy and made in one bowl with no mixer. You can think of them as butterscotch brownies with deliciously gooey centers. I decided to tinker with the classic blondie recipe to get the ultimate butterscotch flavor in blondie form. 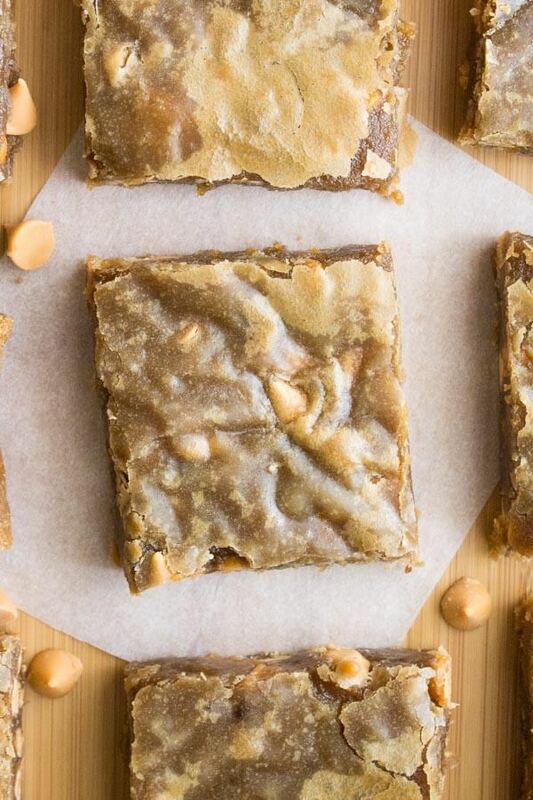 These butterscotch blondies are super chewy, fudgy, dense, buttery… all the words that equal delicious and make every minute at the gym worth it. They’re big on butterscotch taste and filled with butterscotch chips. 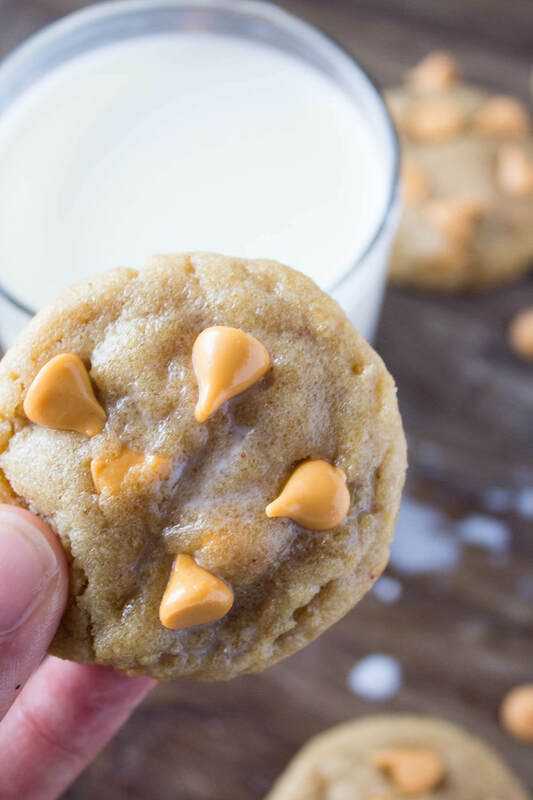 I love butterscotch, but I’ve been having lots of chocolate recently – double chocolate cookies, chocolate chip muffins, left over chocolate chips… I decided it was time for a flavor change up and bring out the butterscotch. And bring out the butterscotch I did. For the complete recipe, you can click here . Otherwise, let’s get into some baking science. Melting the butter is the starting point for the butterscotch. Then the brown sugar gives you the deep color and flavor. Brown sugar is actually what differentiates butterscotch from caramel – so make sure not to substitute it. Then the vanilla and salt balance off the sweetness to give that perfect butterscotchiness that doesn’t taste artificial. 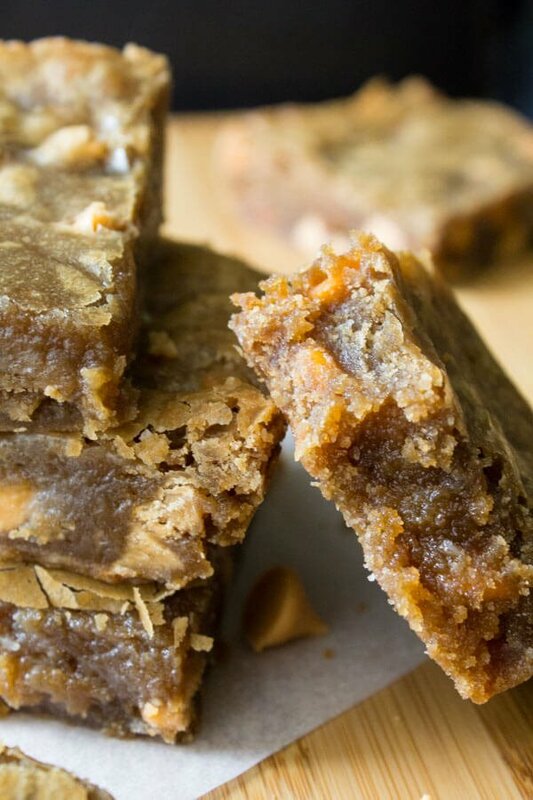 What’s even better about these butterscotch blondies is that they’re so easy to make. Simply melt the butter, then mix in the sugar with a wooden spoon. Stir in the egg and vanilla, and fold in your dry ingredients and butterscotch chips. Your blondies will be baking in no time and filling your kitchen with delicious smells. A delicious, no fuss recipe? That’s my kind of dessert. Now how do you get chewy, fudgy butterscotch blondies that aren’t the least bit cakey? Simple. No leaveners and forget the mixer. Using leaveners and a mixer create air bubbles that cause your batter to rise and lose its dense and fudgy texture. Then, bake your blondies until the top is just set and the edges are slightly pulling away. And Voila! Super fudgy, chewy butterscotch brownies are yours. The hardest part of the recipe will BY FAR be waiting for your blondies to cool before cutting in. So I suggest starting ASAP. Chewy, fudgy, butterscotch blondies are so close! 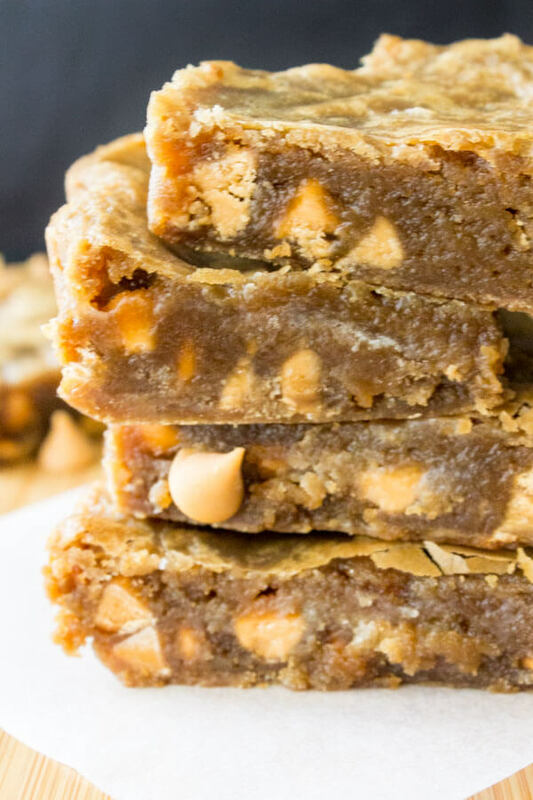 Chewy, fudgy blondies with a rich butterscotch taste and filled with butterscotch chips. These butterscotch blondies are so easy to make, don't require a mixer and only use 1 bowl. Line an 8 x 8 inch pan with aluminum foil and spray with non-stick cooking spray. In a medium bowl stir together the melted butter and brown sugar. Make sure that the mixture isn't hot, then stir in the egg and vanilla. Fold in the flour and salt, and then the butterscotch chips. Pour the batter into your lined pan, and bake for 20-25 minutes until the top is just set and edges are beginning to pull away from the sides of the pan. Let cool in the pan until completely set - at least 1 hour. Then remove from the pan and slice. I got 9 generous squares, or you could do 16 more reasonable sized blondies. Blondies can be kept in an air-tight container at room temperature or in the fridge for up to 5 days. 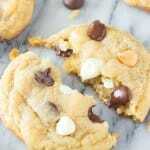 If you love butterscotch – make sure to try these butterscotch chip cookies too! 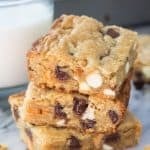 Came across this recipe when going thru a butterscotch phase, and it is now my go to for Butterscotch Blondies! So incredibly easy & Namescrumptious all at the same time! 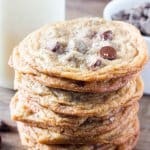 I made an 8×8 pan of these and they’re amazing!! 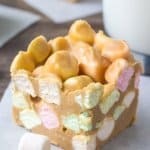 We’re having company over and I’d like to make a 9×13 pan of these- would I double the recipe? Debating if I should try that (not sure on baking time though), or if I should just make 2 8×8 pans since I know they’ll turn out..thoughts? Thanks so much! Doubled the recipe without any problems for a 9″ × 13″ baking pan. Baked it for same amount of time as in the 8″ × 8″ recipe and it was perfect. So glad they turned out for you! And thanks for reporting back with your tips on doubling the recipe! 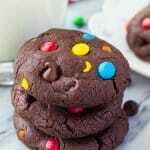 I’ve made these a couple times and they are really easy to make and absolutely delicious! I’m making them a third time and this time I am going to let the butter brown first before I add the brown sugar for some extra nuttiness.